Cornerstone Wealth Management is nationally recognized for its delivery of independent, comprehensive financial planning. This essential work goes beyond traditional investment planning. Our credentialed professionals are more than advisors. They’re partners—ready and able to help you define and pursue your personal financial goals. Cornerstone Wealth Management: Planning to be Our Clients’ Most Valued Asset™. 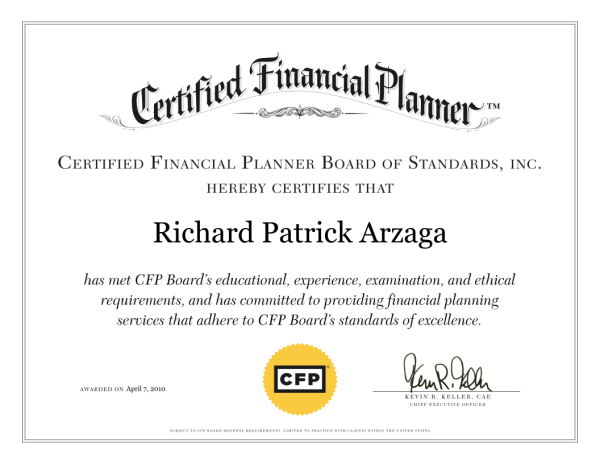 Rich Arzaga is a nationally recognized leader, speaker, and CERTIFIED FINANCIAL PLANNER™. His areas of specialization include wealth management, investing, real estate, and business exit planning and his strategies have been featured in numerous prestigious publications. Rich is an instructor at the U.C. Berkeley Extension where he was recognized by the Financial Planning Program as the 2008 Instructor of the Year. Prior to joining the financial services industry and specializing in personal financial planning, Rich served in corporate senior-level positions for 18 years for a cross section of entrepreneurial, high-growth, and Fortune 500 companies. His role as Executive Vice President of a technology startup significantly contributed to the business being sold for $326 million. Rich’s professional credentials include licensing as an agent for life, disability, and long term care insurances, and financial planning. Rich also holds a real estate broker’s license. Rich’s education includes a BA in advertising from San Jose State University, and Graduate Studies at Northwestern University, J.L. Kellogg Graduate School of Management. He also graduated with distinction from the Personal Financial Planning Program at U.C. Berkeley. Rich currently lives in the East Bay area with his wife, two daughters, and three dogs. Since age 10, Rich has followed baseball and has been a devoted Oakland Athletics fan. He did not miss many games in the early 70s when the A’s won three straight World Series Championships. This loyalty became a problem in middle school when he had his transistor radio and earplugs taken away a few times when he was trying to catch spring training day games. Following this passion, Rich was the first Sports Editor and second Editor-In-Chief at the then new Independence High School newspaper, San Jose, CA. At age 15, he turned these skills into writing articles on local baseball games for the San Jose Sun, Milpitas Post, and Berryessa Sun-Times newspaper franchise. Under his own by-line, Rich was able to write articles about his friends, competitors, and even himself every so often. He was paid $15 per article. Rich leveraged his interest in writing into attending a top graduate school, and then his first professional job in advertising at then start-up PC World Magazine. At that time, he was about half the age of his colleagues. Ask Rich about the importance of being able to write, and he will admit that he could not imagine a career without that important skill. Fast forward, Rich honors the sport he loves by collecting autographed, authenticated baseballs from Hall of Fame and other baseball stars. On many of these balls, players personally added key career stats, making this a unique collection. His favorite ball collected is Sandy Koufax. The oldest player autograph collected is Hall of Famer Joe Sewell, who debuted in 1920. A few more noteworthy balls collected include Mickey Mantle, Joe DiMaggio, Leo Duroucher, Rollie Fingers, and Dave Kingman to more recently Tony LaRussa, Randy Johnson, Perdo Martinez, and Greg Maddux. Dave Winkler is a Wealth Planner with Cornerstone, recognized by WORTH magazine in 2008 as being one of the Top 250 Wealth Planning firms in the country. This distinction is based on the firm’s approach to client service, design and implementation of advanced planning strategies, and on leadership contributions to the industry. Dave is also an Honored Adjunct-Professor in the U.C. Berkeley Personal Financial Planning (PFP) program. Prior to concentrating on personal financial planning, Dave served more than 15 years as Chief Financial Officer for several high-growth technology companies in the East Bay, including one that he took through an initial public offering (IPO), and another where he orchestrated a series of acquisitions for the business. Dave spent his first career sharpening and applying his trade as a corporate financial executive, and utilizes these same principals today to serve as a Personal CFO to Cornerstone clients. His work includes advising clients on planning for financial independence, retirement income, investing, risk management, tax preservation, estate and wealth preservation. Dave’s professional credentials include Investment Adviser Representative registered through Cornerstone Wealth Management, Inc. and LPL Financial LLC, General Securities Registered, and a California Life Insurance License. Dave graduated with Distinction from the PFP Program at U.C. Berkeley, earned his BS in Engineering from the University of Notre Dame, and completed advanced studies in accounting at California State Northridge. He was also honored by the faculty of the PFP Program at U.C. Berkeley as its first ever Student of the Year in 2008. The honor was based on academic excellence, professional teamwork and collaboration, and likelihood of leadership contribution in the industry. Dave resides in San Ramon, California with his wife, Joanne. They have three successful children. Dave is also a sports fanatic, devoted time, energy and money helping his son’s baseball and basketball teams over a 16-year period. And although the youngest of his sons graduated high school a number of years ago, Dave remained behind as Chief Scorekeeper for his son’s former high school varsity basketball team. He continues to enjoy being around a bunch of youngsters and dedicated coaches that have the passion and energy for playing a great game. Michelle Chen joined Cornerstone in 2015 after a successful 14-year tenure at Wells Fargo Bank. She worked at various branches in the east bay, and served as Service Manager at four locations. While at Wells Fargo Bank, Michelle won several awards for excellence and quickly became a well-known member of each community she joined. Since joining Cornerstone, Michelle has been a vital part of our organization and plays an essential role in the lives of clients we serve. Her initial role of office manager has evolved into Client Services, and most recently, para-planning. Michelle lives in San Ramon, California with her entrepreneurial husband and two children. Michelle loves spending time with her children. She is a Disney fanatic, and makes time for several trips to Southern California to “theme-park hop.” She is also a big food fan, loves new restaurants, and enjoys exploring the world. Born in Taiwan, Michelle speaks and writes fluent Mandarin Chinese. She also plays piano and the Guzheng, a traditional Chinese lute. If given the opportunity, Michelle will beat you at Mario Kart, the Nintendo go-kart-style racing video game.